illumiNations is a collaboration between a number of translation agencies, including American Bible Society, Pioneer Bible Translators, Seed Company, SIL International, Wycliffe Bible Translators, United Bible Societies, Biblica, Deaf Bible Society, The Word for the World, and Lutheran Bible Translators. These groups do about 90% of worldwide translation work, and together, their mission is to translate the Bible into every remaining language—in this generation. The organizations began working several years ago to create a central digital Bible library, which they launched in 2010. They’ve since compiled over 1,100 portions and versions of Scripture. They named their collaboration illumiNations, as a reference to Isaiah 60:3, which foretells the nations coming to God’s light: “Nations will come to your light, and kings to your shining brightness” (CSB). In the past, getting the Bible into another language—accessing sources, translating, proofing, printing, and finally, distributing it—often took decades. 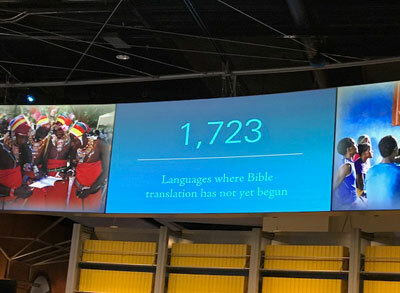 But today, the world’s leading Bible translation ministries collaborate as illumiNations, an alliance created to help them easily exchange ideas, share systems, improve practices, and recruit givers. Working together, they have leveraged advancements in technology, communication, and travel to shorten the translation process, in many cases to just a few years. 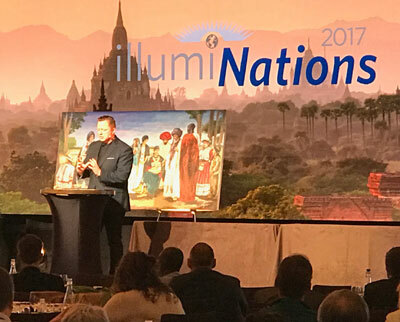 Another benefit of their collaboration is that illumiNations now believes that they can have at least the New Testament translated for 99.9% of the world’s population by the year 2033. At illumiNations events, donors are “exposed to the global need for translation and matched with the most appropriate translation agency based on their passions for particular regions or people groups,” Christianity Today explains. Nanci and I were also part of the groundbreaking 2015 gathering, where $20 million was given to further translation efforts. It was unforgettable, as was this year’s. I loved seeing the unity between the translation groups, which was an encouraging model of the cause being greater than the individual organizations. This year, $49 million was committed by those attending to translate God’s Word into the final 1,600 languages that remain with no Bible. It was, I presume, the largest fundraiser for Bible translation in history. Check out this video recap from the event, which will give you a taste for how powerful it was. Nanci and I so enjoyed connecting with many wonderful people who attended. Here’s a picture someone took on an escalator. 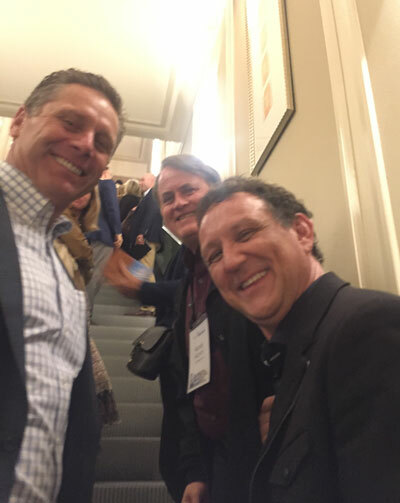 On the left is Hall of Famer Steve Largent (who needs no introduction to Seattle Seahawks fans) and on the right is Randy Phillips of the music group Phillips, Craig and Dean (who’ve written and performed many familiar songs, including “You Are God Alone,” “Here I Am to Worship,” and “Revelation Song”). Steve and Randy were part of the program too, and we were on a bus together coming back from the National Cathedral. We also visited the fantastic Museum of the Bible, where illumiNations has a display. 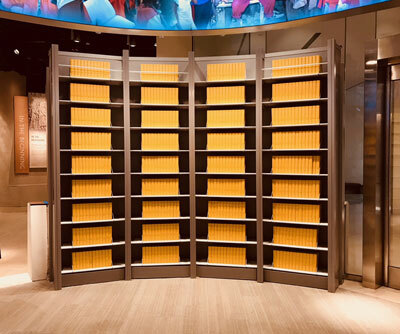 I took this picture in a special Bible translation room which shows in yellow, with each blank book named by its eventual language, the remaining languages that still have no Scripture. 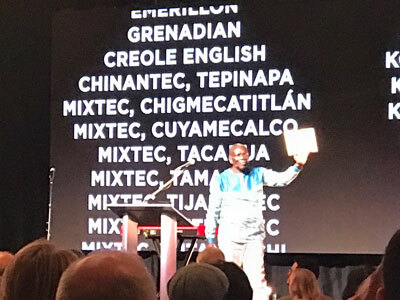 This picture shows an African brother holding up a Bible with blank pages, representing the remaining languages until there are no Bibleless people groups left on earth. Impacting eternity by supporting Bible translation is something we can all be a part of through prayer and giving. I encourage you to check out the illumiNations site, where you can sign up for prayer updates and donate towards translation efforts. The Seed Company is one of the best Bible translation organizations, and the one most heavily supported by EPM.